Partnering with Education: Northglenn High School's AP Psychology class was given a PBL (Problem Based Learning) project to address Autism Spectrum Disorder. Along with their research, student groups created online, public, website resources. The objective was to build resources that the community and educators can use to better understand the spectrum. Problem Based Learning: Northglenn incorporates connections to real-world issues through a problem based learning approach. PBLs engage representatives from business and community who provide professional insight, feedback and relevance. ACEC was approached by John Paul Sampson, the school's STEM Coordinator, who asked if we would judge the student sites and highlight them on our website for public access. 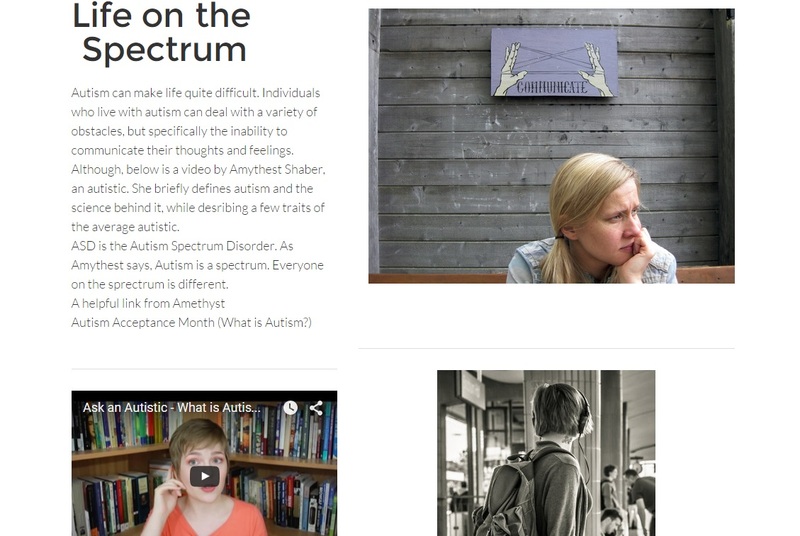 Autism Spectrum Disorder Website PBL: Of the nine websites/groups, the two ACEC selected demonstrate how a topic can be approached from two very different perspectives that augment one another. Group 4’s site has a broad and thorough professional style while Group 8’s site is a more personal, teen-friendly blog style. Both are incredibly valuable.